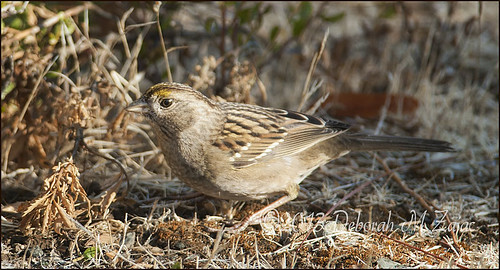 Golden Crowned Sparrow-Winter, originally uploaded by CircadianReflections Photography. I have to double-check, but I think this is my first Golden Crowned Sparrow! So, far this has been a fantastic birding year for me, and it’s still early in the season. Photographing birds in Manual Focusing mode is tough. My finger is always on the focusing ring and I’m adjusting all the time since the birds are so fast and moving all the time. It’s a miracle I got this in focus at all. My friend Dali shoots with a Legacy Nikon lens the 400mm f/3.5 which is a manual focus lens and he gets the most beautiful bird and wildlife photographs. I want to be as good as that if I have to manual focus.